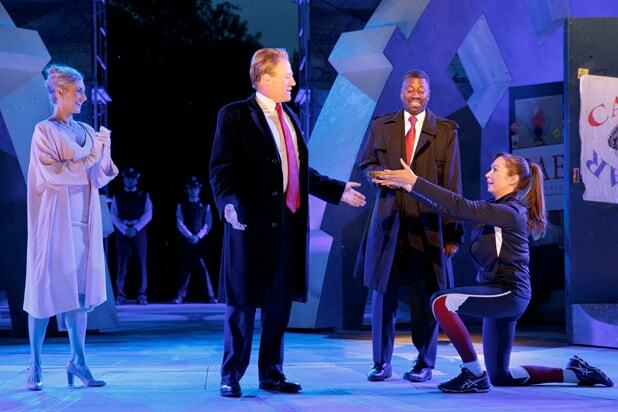 Oskar Eustis, the artistic director of New York City’s venerable nonprofit Public Theater, had a truly crazy idea on the night of the election last fall: Why not reconfigure Shakespeare’s “Julius Caesar” for the era of President Donald Trump? 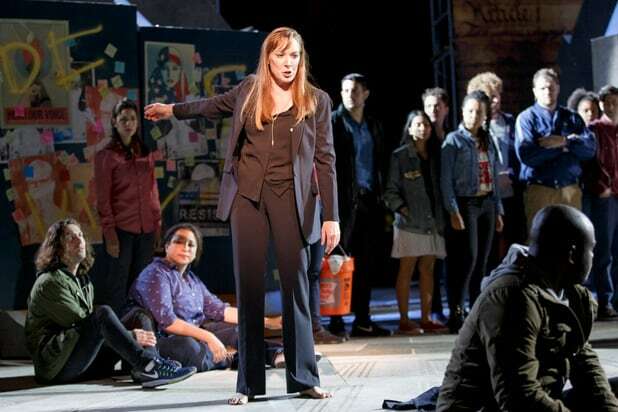 In truth, though, it’s the Bard and not a Trumpified Caesar who gets assassinated in this tasteless and ill-conceived production — which has the presumably unintended effect of making Trump into a powerfully sympathetic character before it ultimately sputters into narrative incoherence. The dark doings are even foreshadowed in the casting of two “House of Cards” alums in critical roles as rival politicians seeking to preserve Rome’s supposedly fragile democracy: Corey Stoll as Brutus, the decent man drawn into a conspiracy whose aftermath he is unable to manage or contain, and Elizabeth Marvel as the Caesar loyalist Marc Antony who rallies the masses to Caesar’s defense after his assassination. And it’s not enough to swath Cassius (a characteristically solid John Douglas Thompson) in the shawl of a “Resist” banner so he plunks a pink p—sy hat on his head for good measure. Like many a high-concept reinterpretation of Shakespeare — and I’ve seen productions set in the Wild West, a women’s prison and outer space — Eustis’ “Julius Caesar” buckles under the weight of its cleverness and dissolves into confusion (and some tedium) just when it should be gathering momentum. There is only so far you can draw parallels to modern times before the lines begin to blur, after all, in this case hopelessly so. Also Read: 'Cost of Living' Theater Review: But Who's Taking Care of the Caretakers? And this high praise comes just after Eustis’ coup de theatre, the protracted and indeed very graphic assassination of Caesar by more than a half-dozen dagger-wielding senators who then wash their hands in copious amounts of stage blood. It’s a scene that should jolt even the biggest Nation-reading, Mar-a-Lago-cursing Bernieites in the audience. 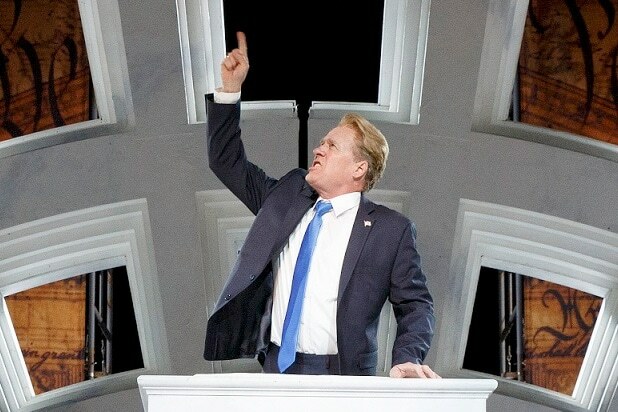 Especially since the remainder of the play squanders our interest as it pits the on-the-lam conspirators against law-and-order Caesar backers hoping to put the republic in the charge of his nephew Octavius (Robert Gilbert). We are usually meant to rejoice at this restoration of order — the senators who went too far have been vanquished, not unlike comic provocateur Kathy Griffin, laid low by her own misguided Trump-assassination meme — but is that still the case when Octavius wears a flak jacket over his suit like a certain presidential son-in-law/adviser? Hail to the new chief, Jared Kushner. I regret that we shall never know the answer to the many questions left by this ill-fated travesty. The fault lies not in the stars — Marvel and Stoll acquit themselves as well as they can, as does the rest of the talented cast. In this case, it lies not in ourselves either. It rests squarely with Oskar Eustis. ‘Cost of Living’ Theater Review: But Who’s Taking Care of the Caretakers?